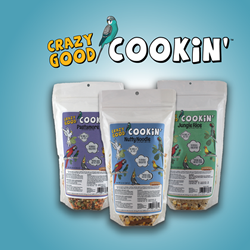 Crazy Good Cookin' is a delicious, nutritious snack that adds fun and flavorful variety to your companion bird’s diet. Each exciting flavor features a blend of wholesome grain, fruit, and vegetable ingredients approved by birds and bird owners alike. Just add water to cook, cool, and serve to your bird. Crazy Good Cookin’ brings extra variety and nutrients to your bird’s diet and should fed in addition to a regular pellet or seed-blend feed, not as a replacement. A nutritious, cookable snack for birds featuring delicious jungle-inspired fruits and flavors. Sunseed Crazy Good Cookin' adds fun and flavorful variety to your companion bird's diet. Made with bananas, brown rice, dates, and pistachios, Jungle Rice brings together delicious flavors from the lush jungle regions with the warm aroma of allspice for an exotic, healthy snack. Just add water to cook, cool, and serve to your bird in addition to his regular pellet or seed-blend diet. Ideal for bird companions of all sizes.